SITE SELECTION 144 • SHOPPING CENTER BUSINESS • May 2018 labor and support services, market wages and logistics, among other factors. IT'S ALL ABOUT SALES Geo-located sales data further shines data gold. Distinct sales volume from on- line points of purchase is now available. Knowing whether those purchases were made from a consumer's office, phone, house or vehicle enables retailers to locate stores to better serve those shoppers. Fur- ther, the point-of-sale (POS) data is also correlated with sales volume to right-size each location. Moreover, a mutual feedback loop helps retailers better understand if sales are generated solely due to general brand awareness or if an awareness of a nearby brick-and-mortar store impacts buying decisions. Data is also used to determine if the consumer previously patronized the retailer's brick-and-mortar store and, if not, the level of incremental sales that can be attributed to a future location. Retailers also layer data to help identi- fy how to steer sales to existing stores through targeted advertising tactics and POS strategies. But data is just the beginning. TECHNOLOGY OVER TALK Today, site selection is more than a well-traveled intersection or data alone. It's more about how technology optimiz- es the intersection of data and local mar- ket expertise. It's one thing for a broker to tell you a site is right for you; it's another to prove it. When the right technology couples with the right process, the proof emerges. Yet, critical to successful analysis is how the technology is applied. To evaluate various approaches to site selection, Gregg Katz, CIO, The Shop- ping Center Group, recommends asking advisors the following questions: • What is your process for identifying po- tential sites? • What technology do you apply to the process? • What roles do your brokers lay? 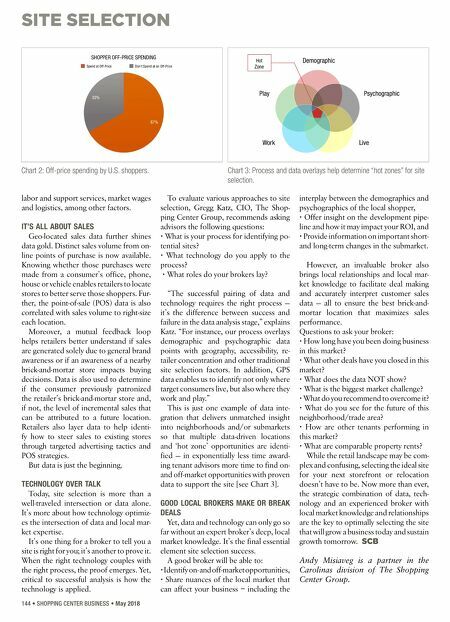 "The successful pairing of data and technology requires the right process — it's the difference between success and failure in the data analysis stage," explains Katz. "For instance, our process overlays demographic and psychographic data points with geography, accessibility, re- tailer concentration and other traditional site selection factors. In addition, GPS data enables us to identify not only where target consumers live, but also where they work and play." This is just one example of data inte- gration that delivers unmatched insight into neighborhoods and/or submarkets so that multiple data-driven locations and 'hot zone' opportunities are identi- fied — in exponentially less time award- ing tenant advisors more time to find on- and off-market opportunities with proven data to support the site [see Chart 3]. GOOD LOCAL BROKERS MAKE OR BREAK DEALS Yet, data and technology can only go so far without an expert broker's deep, local market knowledge. It's the final essential element site selection success. A good broker will be able to: • Identify on- and off-market opportunities, • Share nuances of the local market that can affect your business – including the interplay between the demographics and psychographics of the local shopper, • Offer insight on the development pipe- line and how it may impact your ROI, and • Provide information on important short- and long-term changes in the submarket. However, an invaluable broker also brings local relationships and local mar- ket knowledge to facilitate deal making and accurately interpret customer sales data — all to ensure the best brick-and- mortar location that maximizes sales performance. Questions to ask your broker: • How long have you been doing business in this market? • What other deals have you closed in this market? • What does the data NOT show? • What is the biggest market challenge? • What do you recommend to overcome it? • What do you see for the future of this neighborhood/trade area? • How are other tenants performing in this market? • What are comparable property rents? While the retail landscape may be com- plex and confusing, selecting the ideal site for your next storefront or relocation doesn't have to be. Now more than ever, the strategic combination of data, tech- nology and an experienced broker with local market knowledge and relationships are the key to optimally selecting the site that will grow a business today and sustain growth tomorrow. 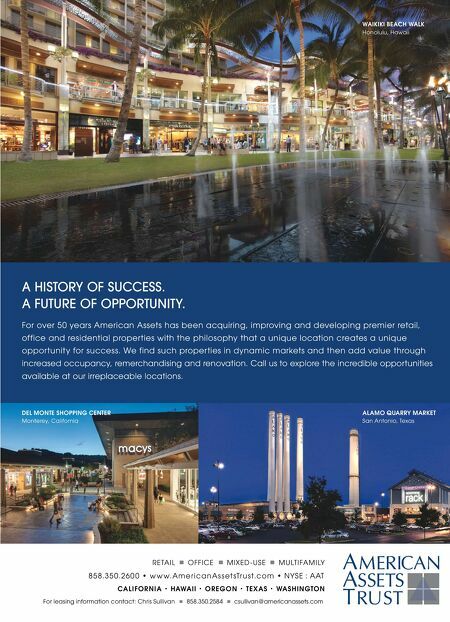 SCB Andy Misiaveg is a partner in the Carolinas division of The Shopping Center Group. Hot Zone Play Work Live Psychographic Demographic 33% 67% Spend at Off-Price SHOPPER OFF-PRICE SPENDING Don't Spend at an Off-Price Chart 2: Off-price spending by U.S. shoppers. Chart 3: Process and data overlays help determine "hot zones" for site selection.